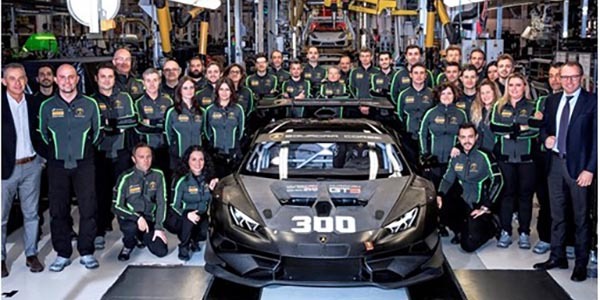 On March 15, in the Huracán assembly line in Sant’Agata Bolognese, the racing car number 300 was produced. This is the number of Huracán racing cars, divided into Super Trofeos and GT3s, that Lamborghini Squadra Corse has produced from 2015 to date, thus being one of the most prolific Motorsport departments in the world. “In 2017, for the seventh consecutive year, Automobili Lamborghini set a new production record, with 3,815 road cars delivered. Equally extraordinary is the number of racing cars that Lamborghini Squadra Corse has produced in just three years since the launch of the Huracán Super Trofeo and Huracán GT3, proving that the growth trend of our brand is definitely positive also with regards to Motorsport customers.” said Stefano Domenicali, chairman and CEO of Automobili Lamborghini S.p.A. In this case, it is a Huracán Super Trofeo Evo, the new model that starting in April will be used for the Lamborghini Super Trofeo one-make series that Lamborghini Squadra Corse organizes in Europe, Asia and North America. The Super Trofeo Evo is manufactured on the same assembly line as the Huracán road version and by the end of 2018, it will be produced in about 70 units to be added to the 180 Huracán Super Trofeos already built from 2015 up to now. The same production line is also used for the Huracán GT3, a model designed for GT racing, which from 2016 to date has been produced in 70 units and has won 10 international titles and the Daytona 24 hours, in the course of only two racing seasons. Lamborghini Squadra Corse is one of the few motorsport departments in the world that can pride itself on manufacturing its own racing cars totally “in-house” from the design to the production, which takes place on the same line as the road Huracán within the factory of Sant’Agata Bolognese. Unlike standard road cars, racing Huracáns are followed along each assembly station by skilled and qualified technicians from Lamborghini Squadra Corse to ensure maximum care in the assembly. On the same day in which the 300th racing Huracán reached the end of the production line in Sant’Agata Bolognese, Lamborghini Squadra Corse extended the TÜV ISO 9001 certification obtained in 2017 for the development and manufacturing processes as well as for the servicing of racing cars. Moreover, the scope of the ISO 9001 certification was also extended to the development and supply of selection and training programs for racing drivers.